Dr. Mark F. Hamilton earned his B.S. in Electrical Engineering at Columbia University, and his M.S. and Ph.D. in Acoustics at The Pennsylvania State University. 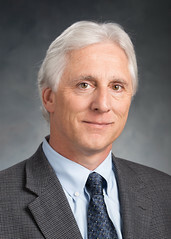 He has served on the faculty of the Walker Department of Mechanical Engineering since 1985, and he is a member of the Graduate Studies Committee in the department of Electrical and Computer Engineering. Dr. Hamilton is also Research Professor at Applied Research Laboratories, which is the largest organized research unit at the University, and its core technical area is acoustics. Dr. Hamilton conducts research in the area of physical acoustics, particularly nonlinear acoustics. His current research interests include acoustic radiation force on objects of arbitrary shape, nonlinear shear waves in relaxing media, shock formation in media with losses characterized by fractional derivatives, nonlinear propagation in granular media, diffraction phenomena in linear and nonlinear sound fields, nonlinear acoustic metamaterials, and single-bubble sonoluminescence in elastic media. Dr. Hamilton is actively involved in the Acoustical Society of America. He has served for twenty years as Associate Editor for the Journal of the ASA covering the fields of physical and nonlinear acoustics. He was elected to three terms as an officer of the ASA, first as a member of Executive Council, then as Vice President, and finally as President. He served for six years on the Governing Board of the American Institute of Physics, he is currently General Secretary of the International Organizing Committee for the International Symposia on Nonlinear Acoustics, and he is the US representative on the board of the International Commission for Acoustics. Dr. Hamilton was a recipient of the David and Lucile Packard Foundation Fellowship for Science and Engineering and the National Science Foundation Presidential Young Investigator Award. He received the Pi Tau Sigma Gold Medal from the American Society of Mechanical Engineers, the Curtis W. McGraw Research Award from the American Society for Engineering Education, the R. Bruce Lindsay Award from the ASA, and he is a Fellow of the ASA. Most recently Dr. Hamilton received a lifetime achievement award from the ASA, its Helmholtz-Rayleigh Interdisciplinary Silver Medal in Physical Acoustics, Biomedical Acoustics and Engineering Acoustics. R. Fievet, C. E. Tinney, W. J. Baars, and M. F. Hamilton, “Coalescence in the sound field of a laboratory-scale supersonic jet,” AIAA Journal 54, 254-265 (2016). W. J. Baars, C. E. Tinney and M. F. Hamilton, “Piecewise-spreading regime model for calculating effective Gol’dberg numbers for supersonic jet noise,” AIAA Journal 54, 2833-2842 (2016). M. F. Hamilton, “Effective Gol’dberg number for diverging waves,” J. Acoust. Soc. Am. 140, 4419-4427 (2016). J. M. Cormack and M. F. Hamilton, “Overturning of nonlinear acoustic waves in media with power-law attenuation,” Proc. Mtgs. Acoust. 28, 045001 (2016). K. S. Spratt, M. F. Hamilton, K. M. Lee, and P. S. Wilson, “Radiation damping of, and scattering from, an arbitrarily shaped bubble,” J. Acoust. Soc. Am. 142, 160-166 (2017). J. M. Cormack and M. F. Hamilton, “Plane nonlinear shear waves in relaxing media,” J. Acoust. Soc. Am. 143, 1035-1048 (2018). Yu. A. Ilinskii, E. A. Zabolotskaya, B. C. Treweek, and M. F. Hamilton, “Acoustic radiation force on an elastic sphere in a soft elastic medium,” J. Acoust. Soc. Am. 144, 568-576 (2018). T. S. Jerome, Yu. A. Ilinskii, E. A. Zabolotskaya, and M. F. Hamilton, “Acoustic radiation force and torque on nonspherical scatterers in the Born approximation,” Proc. Mtgs. Acoust. 34, 045013 (2018). T. G. Muir, J. M. Cormack, C. M. Slack, and M. F. Hamilton, “Laboratory study of linear and nonlinear elastic pulse propagation in a sandstone bar,” Proc. Mtgs. Acoust. 34, 065004 (2018).